Our guide to Decking offers detailed descriptions of companies such as Cedar Creek Lumber LLC and Deckorators. 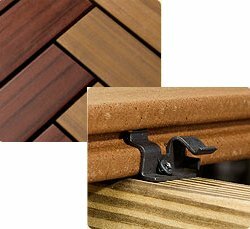 Trex is the best-known brand of alternative decking, railing, fencing, and trim products. Its composites are made of a combination of wood and plastic fibers. Trex gets its plastic and wood fibers from reclaimed or recycled resources, including sawdust and used pallets from woodworking operations, and recycled plastic grocery bags from all over the country. 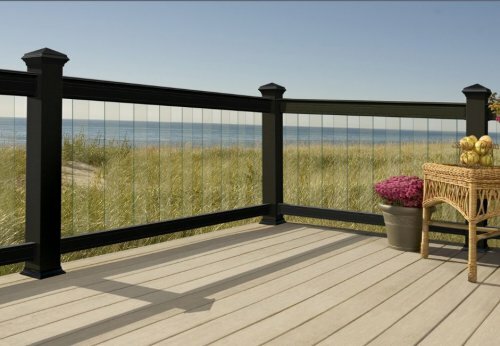 A division of Universal Forest Products, Deckorators specializers in non-wood deck railings and posts. One of their signature products is a glass baluster system. Bay Tree Technologies supplies earth friendly, sustainable wood products to contractors and homeowners. PureWood Decking, thermally modified, rot resistant wood, is a signature product. Cedar Creek Lumber offers shingles, shakes, decking and other milled products from both Western Red Cedar and Douglas Fir. The company specializes in recovered timbers -- and says it will meet its customers' needs even if this means turning to other mills, or doing a custom run of millwork. Boston Cedar is a major Northeastern distributor of trim, decking, siding and millwork purchased in large quantities from western mills. Located near Chicago but shipping its products nationally, offers a large selection of plastic lumber for use in making decks, docks, fencing and such. The company also makes and sells plastic patio and garden furniture, such as picnic tables and benches. Mountain Lumber reclaims antique wood from abandoned factories, mills, barns, and even breweries � and then mills it into flooring, mouldings and architectural elements. The company is one of the older - and best known - makers of high-end flooring from reclaimed wood. A leading timber framing company for the past 25 years, Blue Ridge Timberwrights uses traditional hand-crafted techniques, as well as modern methods, to create a wide range of residential, recreational and commercial timber frame buildings. Wood, Steel & Glas, Inc. This lumber mill specializes in fine Atlantic and northern white cedar, old-growth cypress and reclaimed old-growth redwood. Located near Asheville, N.C., Carolina Colortones is a major supplier of prefinished decking, siding and trim. Cedar wood siding milled to look like smooth or hand-hewn logs. Also: paneling and cedar flooring. This company produces rot resistant Cypress siding, trim and decking, as well as high-end heart pine flooring. Deliveries arranged with bigger purchases. Glass balusters make an invisible railing for a fraction of the typical price. Smooth installation for this decking with special hidden fasteners.